Not to be confused with Jack Kirby. Jack St. Clair Kilby (November 8, 1923 – June 20, 2005) was an American electrical engineer who took part (along with Robert Noyce) in the realization of the first integrated circuit while working at Texas Instruments (TI) in 1958. He was awarded the Nobel Prize in physics on December 10, 2000. To congratulate him, US President Bill Clinton wrote, "You can take pride in the knowledge that your work will help to improve lives for generations to come." He is also the inventor of the handheld calculator and the thermal printer, for which he has patents. He also has patents for seven other inventions. Kilby received his bachelor of science degree from the University of Illinois at Urbana-Champaign, where he was an honorary member of Acacia Fraternity. In 1947, he received a degree in Electrical Engineering. He obtained his master of science in Electrical Engineering from the University of Wisconsin-Extension in Milwaukee (which later became the University of Wisconsin–Milwaukee) in 1950, while simultaneously working at Centralab in Milwaukee. In mid-1958, Kilby, as a newly employed engineer at Texas Instruments (TI), did not yet have the right to a summer vacation. He spent the summer working on the problem in circuit design that was commonly called the "tyranny of numbers" and finally came to the conclusion that manufacturing the circuit components en masse in a single piece of semiconductor material could provide a solution. On September 12 he presented his findings to management, which included Mark Shepherd. He showed them a piece of germanium with an oscilloscope attached, pressed a switch, and the oscilloscope showed a continuous sine wave, proving that his integrated circuit worked and thus that he had solved the problem. U.S. Patent 3,138,743 for "Miniaturized Electronic Circuits", the first integrated circuit, was filed on February 6, 1959. Along with Robert Noyce (who independently made a similar circuit a few months later), Kilby is generally credited as co-inventor of the integrated circuit. Jack Kilby went on to pioneer military, industrial, and commercial applications of microchip technology. He headed teams that built both the first military system and the first computer incorporating integrated circuits. He later co-invented both the hand-held calculator and the thermal printer that was used in portable data terminals. In 1970, he took a leave of absence from TI to work as an independent inventor. He explored, among other subjects, the use of silicon technology for generating electrical power from sunlight. From 1978 to 1984 he held the position of Distinguished Professor of Electrical Engineering at Texas A&M University. In 1983, Kilby retired from Texas Instruments. He died of cancer June 20, 2005 at the age of 81, in Dallas, Texas. On December 14, 2005, Texas Instruments created the Historic TI Archives. The Jack Kilby family donated his personal manuscripts and his personal photograph collection to Southern Methodist University (SMU). The collection will be cataloged and stored at DeGolyer Library, SMU. In 2008, the SMU School of Engineering, with the DeGolyer Library and the Library of Congress, hosted a year-long celebration of the 50th anniversary of the birth of the digital age with Jack Kilby’s Nobel Prize-winning invention of the integrated circuit. Symposia and exhibits examined the many ways in which technology and engineers shaped the modern world. Jack Kilby held an honorary Doctorate of Science from SMU and was a longtime associate of SMU through the Kilby Foundation. Recognition of Kilby’s outstanding achievements have been made by the Institute of Electrical and Electronic Engineers (IEEE), including the election to IEEE Fellow in 1966, the IEEE David Sarnoff Award in 1966, co-recipient of the first IEEE Cledo Brunetti Award in 1978, the IEEE Centennial Medal in 1984 and the IEEE Medal of Honor in 1986. He was co-recipient of the Franklin Institute’s Stuart Ballantine Medal in 1966. In 1982 and 1989, he received the Holley Medal from the American Society of Mechanical Engineers (ASME). He was elected to member of the National Academy of Engineering (NAE) in 1967, received the Academy’s Vladimir K. Zworykin Award in 1975, and was co-recipient of the first NAE’s Charles Stark Draper Prize in 1989. The Kilby Award Foundation was founded in 1980 in his honor. In 1993 he was awarded the prestigious Kyoto Prize by the Inamori Foundation. He was awarded both the Washington Award, administered by the Western Society of Engineers and the Eta Kappa Nu Vladimir Karapetoff Award in 1999. In 2000, Kilby was awarded the Nobel Prize in Physics for his breakthrough discovery, and delivered his personal view of the industry and its history in his acceptance speech. Kilby was awarded nine honorary doctorate degrees from Universities including Southern Methodist University, the University of Miami, University of Illinois, University of Wisconsin-Madison, Texas A&M University, Yale and Rochester Institute of Technology. The National Chiao Tung University (NCTU) in Taiwan awarded Kilby with a certificate of Honorary Professorship in 1998. Geoffrey Dummer, the British engineer who first conceived the idea of the integrated circuit. ↑ The Nobel Prize in Physics 2000. Nobelprize.org. Retrieved on 2013-11-21. ↑ "Jack Kilby". TI. Retrieved 27 May 2014. ↑ "The Chip that Jack Built". IT Invention. Retrieved 27 May 2014. 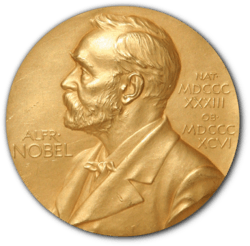 ↑ "The Nobel Prize in Physics 2000". Nobel Foundation. Retrieved 2011-07-14. ↑ "IEEE David Sarnoff Award Recipients" (PDF). IEEE. Retrieved December 6, 2011. ↑ "IEEE Cledo Brunetti Award Recipients" (PDF). IEEE. Retrieved December 6, 2011. ↑ "Holley Medal". American Society of Mechanical Engineers. Retrieved December 6, 2011. ↑ "NAE Members Directory - Mr. Jack S. Kilby". National Academy of Engineering. Retrieved December 6, 2011. ↑ "School of Computing - Facilities & Resources". Edinburgh Napier University. Retrieved July 24, 2012. Honoring Jack Kilby website, with resource archive of articles, Kilby statue in Great Bend, KS etc. "Video about Jack Kilby" on YouTube, video presentation from Texas Instruments. "Jack Kilby, Touching Lives on Micro and Macro Scales" by T.R. Reid, The Washington Post (June 2005). "IEEE Global History Network - Jack Kilby: Biography". IEEE. Retrieved March 2, 2011.